ShortScale :: View topic - Cheap Synth Suggestions? Posted: Thu Mar 25, 2010 12:27 am Post subject: Cheap Synth Suggestions? I just got some coin from selling my old trumpet and was thinking of buying some music gear. I looked at multi-effects pedals but old shortscale threads say they aren't worthwhile. I would like to get a decent synthesizer as well, but within a $100 price limit. Any good analog ones that are easy to find? Also, would I be able to hook it up to my twin reverb or would I need another amp? You're certainly not going to get a real analog synth for less than 100 dollars. A "decent" synth for 100 is also pretty unlikely. Decent, cheap, popular synths are the Korg MicroKorg and the Alesis Micron. Both run about 350 new. I got my Microkorg for 250 used. Both are digital and both are pretty powerful little suckers for the price. Check out Vintage Synth Explorer if you're interested in learning more about real synths. Guitar amps are voiced to have a frequency range that is narrower than what keyboards and synths produce. You could run it through your twin and honestly it would sound alright for most applications, it would just have a very pronounced midrange and attenuated highs and lows. Also most keyboards have a much louder output than guitars, so you'd want to keep the keyboard volume quiet to avoid overdriving the preamp and then adjust the volume on the amp to the desired level. Thanks, I think I'll just save up and buy a microkorg or equivalent. I was thinking of going for a lo-fi sound recently and my blues driver is good for some of this but it gets too harsh too fast. I was thinking of something like the radio dept. but their sound might be due to the fact that they use a 4 track to record their stuff. Buy a Nintendo DS and an R4 type card. Get Korg DS-10, and a few other programs. There's not nearly enough stuff on there. There's only two tracks, but you can get an awful lot of sounds from a DS. I need to finish off what I start. A quick google search says they have at one time or another used a Roland Juno-60 and some sort of Nord, probably one from the Lead series. The Juno-60 can be had in the range of $600. Nords are in the $1000 range. A Microkorg isn't really the same caliber of instrument, but it'll get you part of the way there and teach you a lot about how to operate a synthesizer. Plus, there is a pretty strong used market for them if you want to upgrade later. I think that's probably the way to go. Thanks for the advice, I'm not sure what I'm gonna do yet (brain is overloading with history paper) but will inform if I make a purchase. That's so ridiculously small, awesome. Looks alright in videos. I might look around at some pawn shops to see if they got anything. I have one that I got in the 80s when I was a kid and have held on to it all this time because it's so awesome. 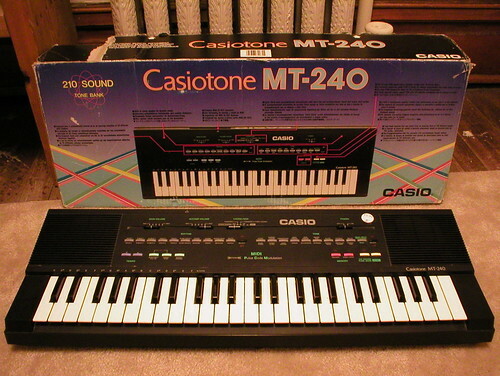 it's the first keyboard/synth Casio ever made. It's a combination monophonic synth/calculator. It has a 100-step sequencer and a programmable ADSR mode. and best of all they're still pretty cheap. last time I checked you could find them for $20 - $40 on eBay. Radiohead and Grizzly bear both use a Casio SK-1 Sampling keyboard, they can be found a thrift stores for a few bucks and ebay for about $40. i've got one of those. they're more like toys though, that's the only thing. the keys are small, even for my titchy digits. Nords are utterly phenomenal synths, but as you said, well over the 1000 mark. 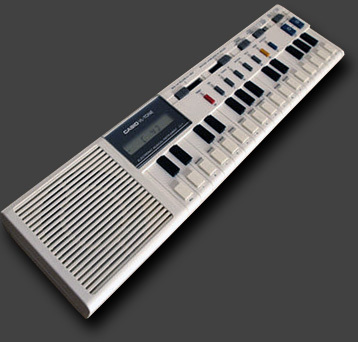 I would highly recommend the Microkorg, its relatively cheap and has a great range of sounds. Plus the vocoder and the arpeggiator provide days worth of dicking about. I just see the PT-87 has a more sophisticated keyboard. Novation make some nice stuff...You can pick up some of their older lines 2nd hand for stupidly-low prices these days. I have a K-Station & whilst the presets are not to my tastes, it's easy to edit (knobs & sliders for most of the commonly-used parameters) and you can get some great noises out of them with a bit of perseverance. My Roland D-10 was fairly cheap second-hand. �100 including hard case and rusty stand, they were going for around �50 on their own. that korg monotron looks hot man!cant wait till may! have you thought about a controller and some soft synths? and what you want out of it.if you get fed up with your sounds you can always download somemore vst's. I don't really have a good laptop to lug around, but I am computer savvy. I found a Casio CT-460 locally and might check it out.